Friday, 27th June 2014, at 0730 and I was back at our club’s most popular pool for the first time since March of this year when I ended my piking season. Even for me this is quite a passage of time to visit here but as this pool is predominantly a carp pool, and carp aren’t really a particularly favourite species of mine, I’ve tended to head to our non-carp pool and also I’ve picked up a card for another club’s waters which I’ve been trying out recently. So, anyway, I decided to have a trip back here as a catch is ‘certain’ – one of the reasons for its popularity, I suppose, along with its closeness to the club’s ‘home base’…. Weather for the day was forecast for heavy rain – and I suppose that was the reason I was the only person gracing the banks for the whole day. However, the weather was quite OK in general, mostly dry and warm – too warm for me really as, before I left the house, I’d donned a thermal layer as it seemed a bit chilly at that time but by the time I’d arrived at the pool it had warmed up a fair bit and remained so. However, there were a few spells of rain – about an hour of light drizzly type stuff and two half hour heavier bursts, the last one accompanied by thunder and lightning. 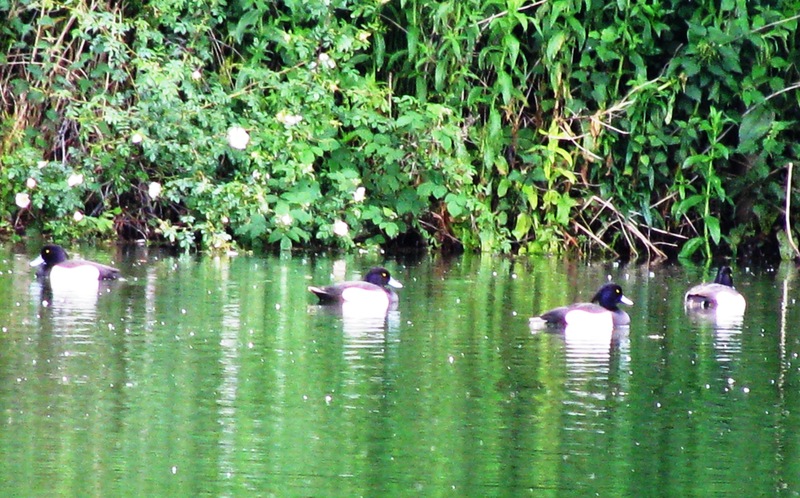 But on arrival the brolly/shelter had been set up in anticipation and so this was just a minor inconvenience…. And soon after this last cloud burst the skies cleared to blue skies and bright sunshine for the duration. On arrival, I baited up two swims (but barely used them!) 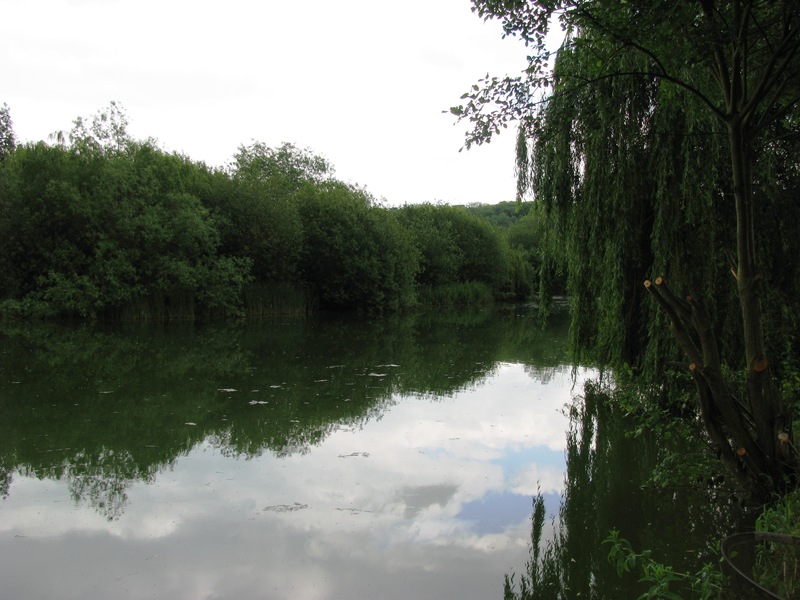 by spombing out breadcrumb, dried blood, mixed particles and maggots – one baited area being on the edge of the overhanging willow tree that you can see in the photo above, the other in open water to the right in line with the tall tree next to the house in the previous picture and level in distance with the willow. The willow tree swim was fished with extra-hot chilli coated sausage and the open water swim was fished on bread – bar for only the first hour or so. The reason I didn’t actually fish those swims much was that there was a lot of surface activity going on with fish defying gravity and ‘falling’ out of the water in a vertical direction and so I catapulted out loose floating bread and this was soon slurped up… and so I wound in my leger rods and swapped over to using my ‘floater’ rod which I had set up earlier. 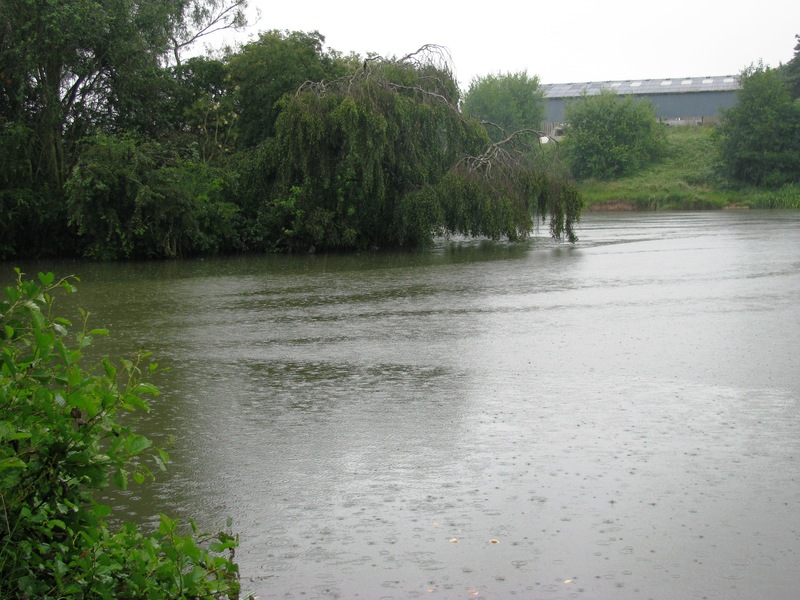 But, as I say, the fish seemed to be taking floating baits well and I love to fish floaters especially for carp – the creme de le crème method which adds a bit of enjoyment to catching an otherwise, to me, mediocre species. And so the floater rod came into operation – basically a 10’ 1.75lb TC rod (actually a 1970’s Winfield ‘Specialist Angler’ rod) loaded with 30lb greased braid (to make it float) straight through to a size 4 Kamasan B981 barbless hook. Also on the line are a few tranklements – small leger stops that enclose a small link swivel and a small cork ball, the purpose of which are (a) stops – to keep the swivel within a defined area ie to set the length of the end piece/hooklength, (b) link swivel – to attach a ‘float’ for adding casting weight if needed – but not used yesterday as the fish were within 10 yards of the bank and often just a few feet away and (c) the cork ball is to counteract the weight of the swivel and stops when they are not used and so keep the line fully buoyant. And so that is how I fished for the rest of the day until I packed in at around 1530 – using bread/crust or pieces of yorkshire pudding (49p per bag of 12 from Aldi – each provides about 1-4 baits depending on the size of bait you want). I kept the interest of the fish up by throwing out loose pieces from time to time and action was virtually non-stop (apart from the time spent sheltering from the rain). 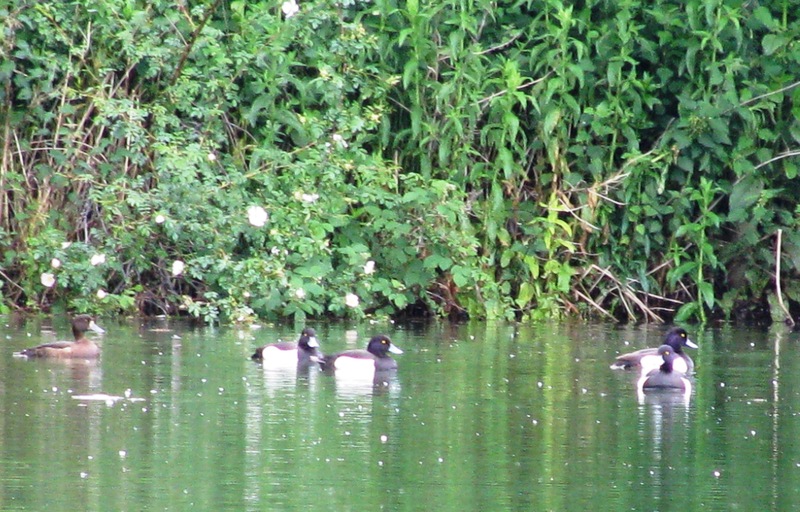 Session 28 – Early Morning On The Staffs-Worcs Canal. 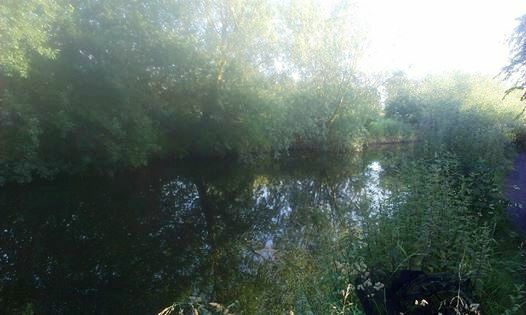 Tuesday, 24th June 2014, at 0430 and I was casting in on the Staffs-Worcs Canal near Wombourne again in my usually favourite peg near Awbridge. I set up my stall to leger (quivertip) maggot, worm and meat and fed some breadcrumb laced with hookbait samples at the start of the session and then regularly catapulted out further small samples of hookbaits. Over the 5.5 hours I fished, I was having bite after bite on maggots and worm but had not a touch on the meat after an hour or so. And the bites received were very quick, albeit very violent, pulls and drops and not many bites were turned into fish on the bank. 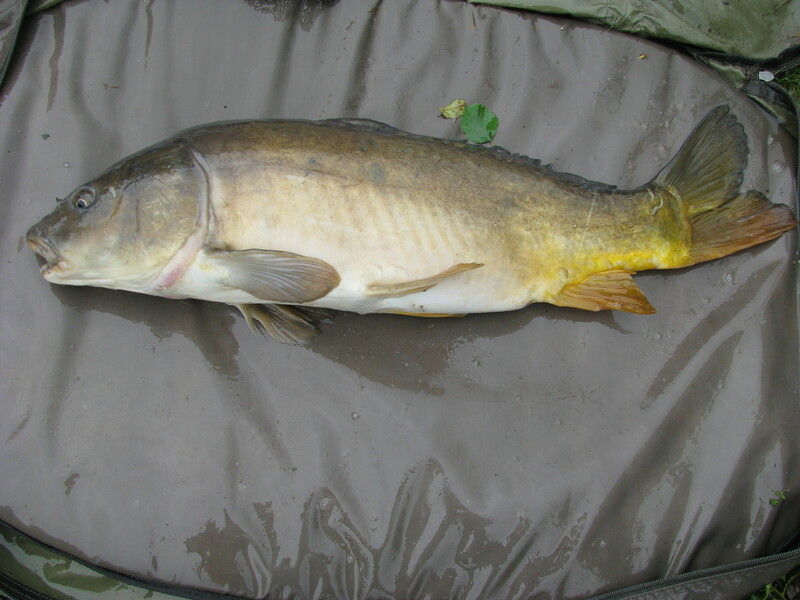 However, from the fish caught it seems that the reason for this poor bite:capture ratio was due to the size of fish involved – I had 1 gudgeon and 3 chub… but the gudgeon was the largest of the batch which probably totalled a whole 1oz in all! 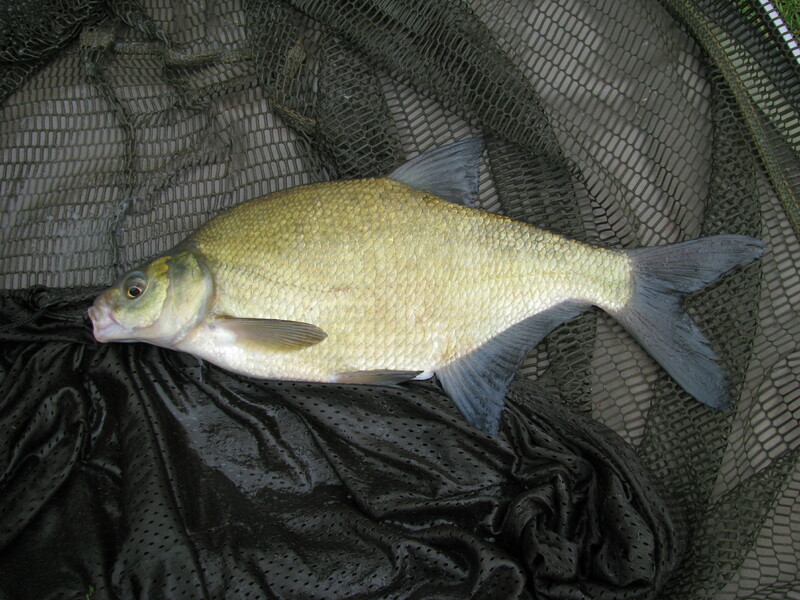 Usually this swim has been good for perch, decent sized chub … and quite regularly daddy ruffe have been featured too. Anyway, I packed in around 0930 with a few boats starting to pass and headed back to the car. But I decided to have a look at a couple of stretches (actually, they turned out to be one stretch when I walked them, just approached from opposite ends and met in the middle). I did locate some nice looking areas worth a try for my next outing – but car parking seemed a bit of a problem that needs to be resolved. I need to look on the club’s website to see if they say anything about ‘best places’ for the parking. Saturday, 21st June 2014, and Liz and I were fishing the waters as detailed at the end of the last post. We arrived around 0630 to ensure that we got the swim that had been selected for our day by myself. I must admit Liz wanted to fish elsewhere and I think she may have been right! Anyway, fishing was to commence at 0700 and so we busied ourselves tackling up and pre-baiting and eventually made our first casts at the dam end of the pool around at around 0720. We both legered with 2 rods each, Liz using meat and maggot baits and myself used bread and sweetcorn/maggot cocktails. 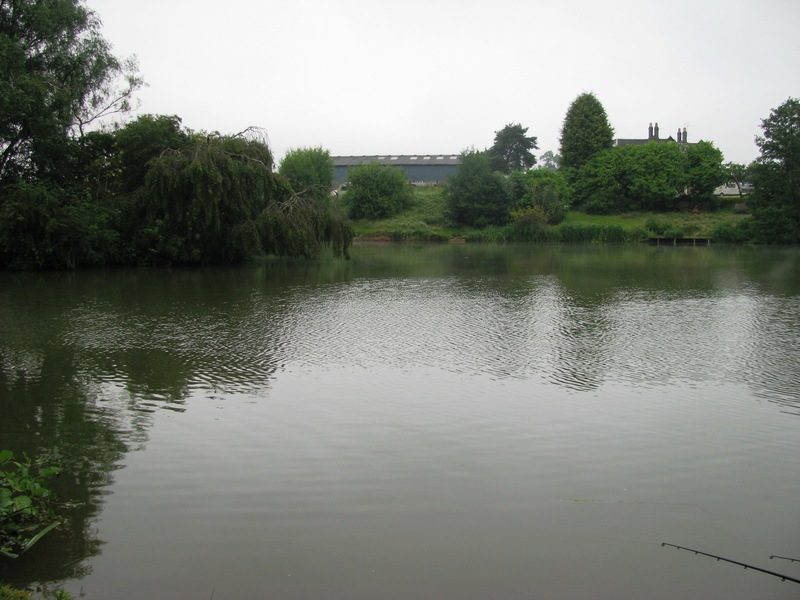 We packed up at 1530 – as Liz had an evening works party to attend and I needed to sort out the bags and put away baits, etc and also prep my tools ready for the following day’s work party on one of club’s own pool waters. 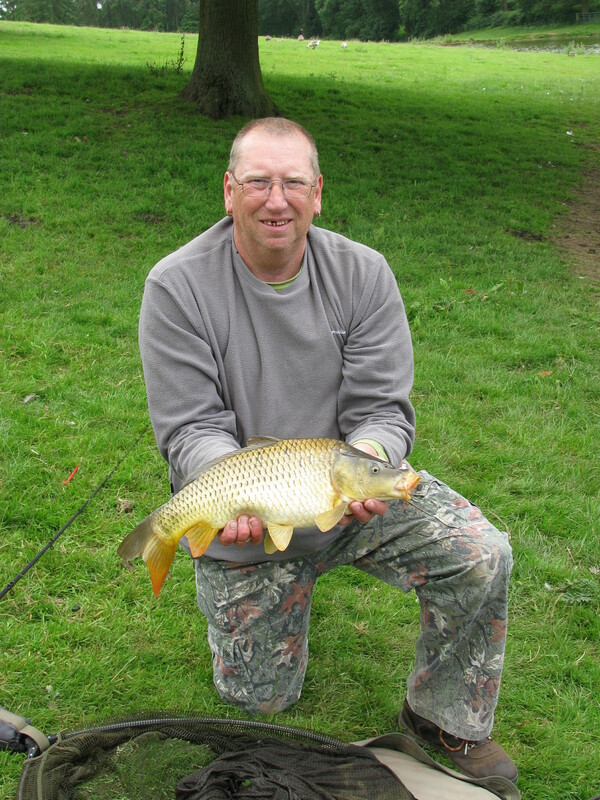 So, back to the pool that we were fishing… This is the fourth year that we’ve fished there and usually have a good catch of tench and carp between us but this year we did not do quite as well with only 1 tench (about 1.5lb), 2 crucian carp of about 1lb each and 4 carp – 4lb 15oz, 4lb 6oz, 4lb 2oz and about 3.5lb between us. However, we were getting bite after bite – those fast twitchy ones that are indicative of crucians and nothing substantial to strike at really. Oh well, next year then! And so I was on the water, tackled up and fishing by 0445, on a beautiful morning. I baited up under the overhanging trees on the far bank on arrival with breadcrumb, a few particles (corn, wheat, etc) and dead maggots. And also catapulted a few prawns and mussels over too. Tackle for the day was a 10’ Syntra quiver tip rod, with 6lb mono mainline terminated with a short braid hooklength (various hook sizes used). Casting/leger weight was supplied by a 1/2oz bomb attached to a sliding bead with a short/ mono link that had a couple of wooden beads fixed next to the sliding bead… this is so that as the lead fell through the water the buoyant wooden beads held the link vertical and so on reaching the bottom it would allow the lead to sink into any silt but as the sliding bead is (hopefully) held above it then there should be no encumbrance to the free passage of the line passing through that bead. Starting bait for the day was a bunch of 5-6 maggots on a size 12 hook cast into the baited area. Various plucks and tweaks were observed and one 3” gudgeon landed. After a couple of hours, I changed over to prawn and mussel baits on a size 6 hook for an hour and a half, getting two or three tweaks on the mussel but nothing on prawn. I then switched back to maggot but this time with 2-3 maggots on a size 16 hook. Again quick twitches, sometimes quite violent, but I was unable to connect. And so, the session ended with just the one gudgeon. What was quite pleasing though was that not one boat passed by – usually the first boat passes at about 0800 this time of the year. 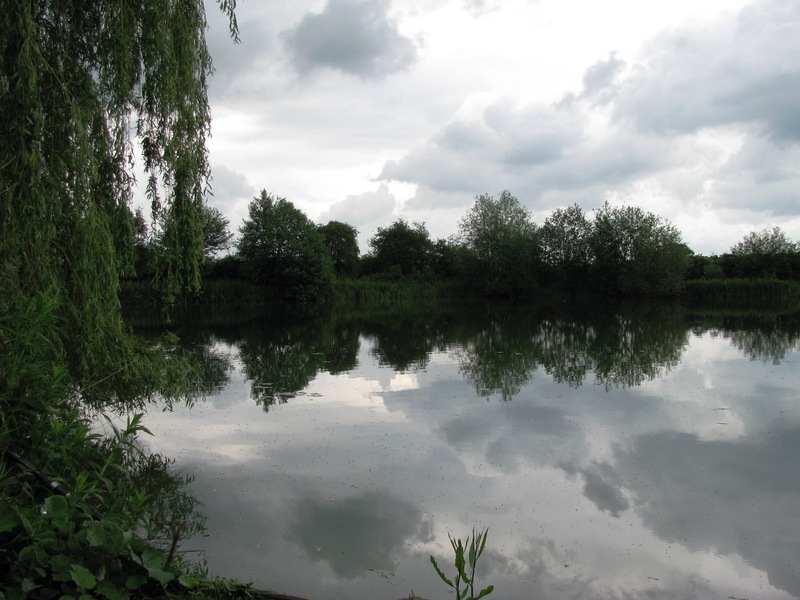 I intend to return next week but hope to fish a bit further along the stretch at my favourite swim – just below a lock, it has an eddy and can usually be counted on for a few perch plus the possibility of a chub or two. Friday 13th June 2014, was a turn for the better after the previous two outings. Firstly, it was hot, sunny and dry – and, in fact, the first session of 2014 that I did NOT wear at least one item of thermal clothing – no base layers, no army long johns, NOTHING! And even I was forced whilst fishing to remove not only my jacket but my lightweight jumper too – most unlike me as removing the jacket usually only occurs two or three times a year! 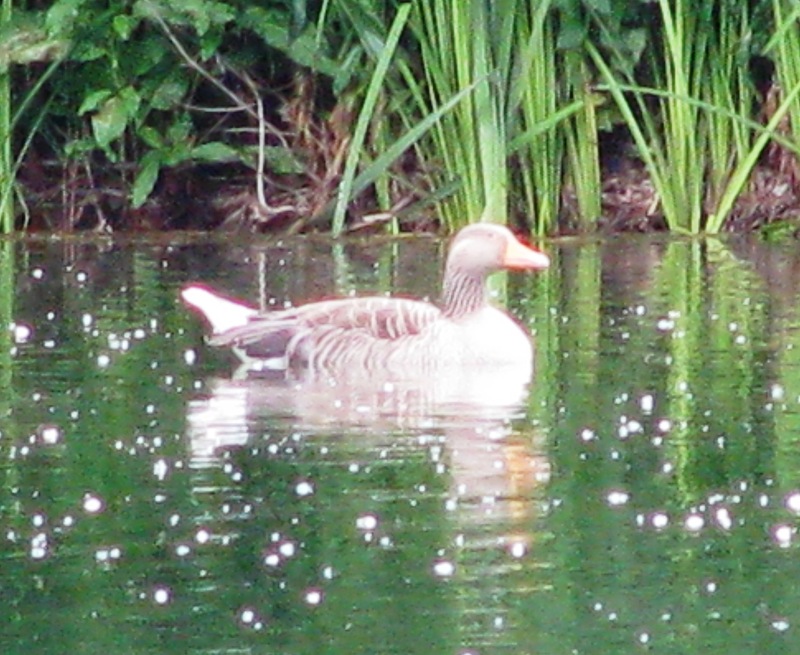 OK – as to the fishing – that wasn’t too bad either as you’ll see but I’ll lead you through my day…. Set off from home at 0600 over to a pool the other side of Newport, Shrops that I’d planned to visit and mentioned in my previous posting. Found the pool – a first visit for me – without difficulty… well, it was only one turn off the A41 so was never going to be difficult. Parked up the car and then went for a walk around to check out a good swim for the day. So, given this, I found a nice swim at the bottom end of the pool and baited up with a few catapults of mixed particles and a few of maggots. And, as there seemed to be a lot of surface activity, I ‘pulted a few piece of floating bread too to see if there would be any interest. I started off float-fishing (laying-on) with my usual set up (6lb mainline, 4” 6lb braid hook length and size 12 hook, and an antenna float overshotted) baiting the hook with maggot. However, with the over-hormonal carp zooming around I was getting a lot of line bites and the broken weed that was being created and drifting about was a bit of a problem too. So, I switched over to my ‘floating bait’ rod fitted with 30lb (greased to float) braid straight through (a bit OTT for this situation but I mostly use it on waters expecting large carp close in) to a size 10 hook … smaller than my usual size 4 or 6 but the rules of the controlling club limit hook sizes to a maximum of size 10. Also on the line is a link swivel that can be used to attach a controller float if needed (basically used as weight for longer casting than be made with the bait alone) but which wasn’t required this time and a cork ball to help keep the line floating near the bait and to counterbalance the link swivel when not in use. 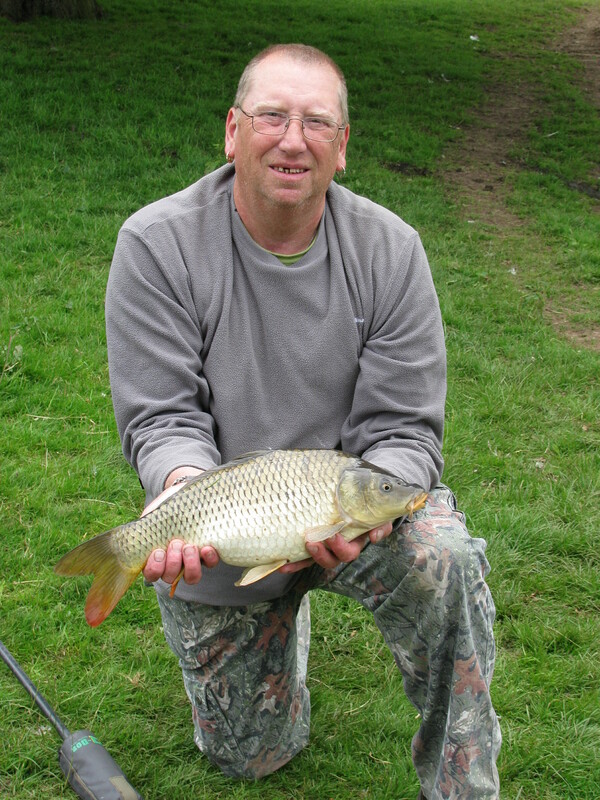 I baited with pieces of bread and eventually I had a take – a rudd of around 4oz. After this, not much seemed to be too interested and about 30 mins later I switched back to the float rod, adding a worm to the maggots as bait this time. 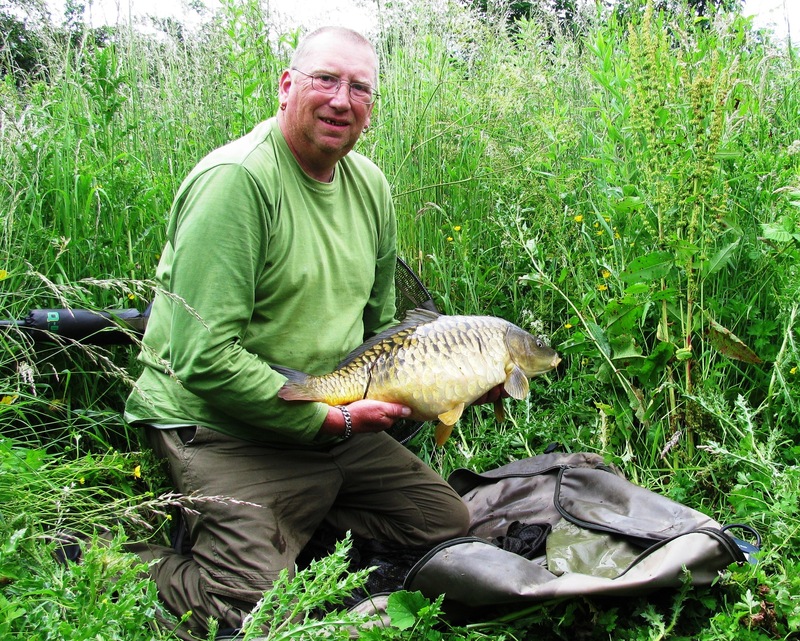 And this added a small crucian carp to my list…. 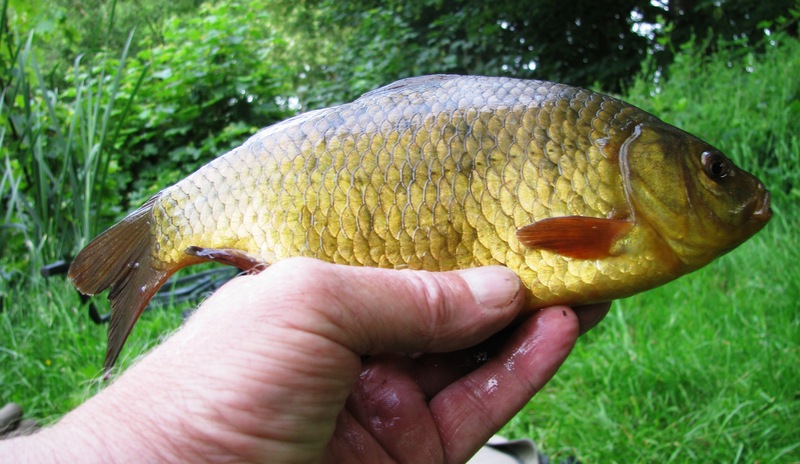 However, as I said earlier, with the breeding carp, fishing was difficult with line bites and the floating weed and I also feel, in general, that carp are so ‘hyper’ when in the spawning mood that they tend to disquiet the other fish and so makes them less interested in feeding. And with this in mind I decided after being at the pool for around 3 hours that I’d move on and visit a water of my main club’s at Lilleshall that was on the way home for a few hours. 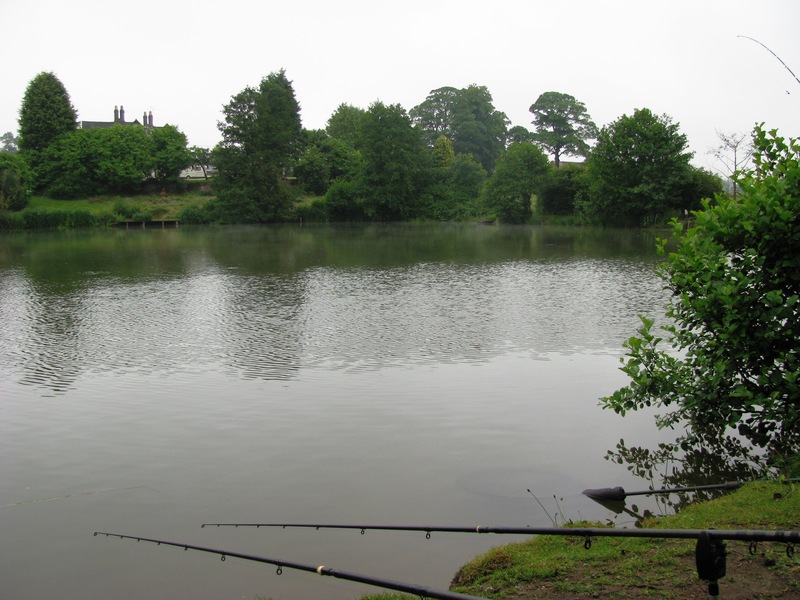 So, I arrived at the Lilleshall water at around 1100, to find a friend of mine and another there having been night fishing over the previous two nights with a bit of success and the news was good – fish were feeding! My mate was fishing the swim I had fished on my visit of the week before but I had intended to fish another peg further up the pool but it seemed his mate was in that swim – but as it turned out he wasn’t when I looked across from the far bank later – and so I decided to give a swim on the corner of far bank a go but on arriving there I found a scum and a lot of debris collected there and so continued up a few swims and settled in peg 16. So I set up my two leger rods, both 8lb mainline, 4” 8lb braid hooklength but with a size 12 hook on one and a size 6 on the other. The swim was baited with prawn, mussel and maggot both to the left and right. The right hand side was fished with maggot/worm on the size 12 and the left with mussel/prawn on the size 6. And again I threw out some bread pieces to see if floating baits would be taken. So, making as little disturbance as possible obviously, I deigned to get my ‘floater’ rod out of the quiver, changed that tiny size 10 hook to a more suitable size 6, and placed a floating bread bait just out in front. Within 20 minutes the carp was back, taking firstly a couple of free floating bread samplers and then the bait piece and – as *the line started to straighten* – I lifted and pulled firmly into the fish and then all broke loose with the fish tearing off down the edge of the pool under overhanging bushes, etc. 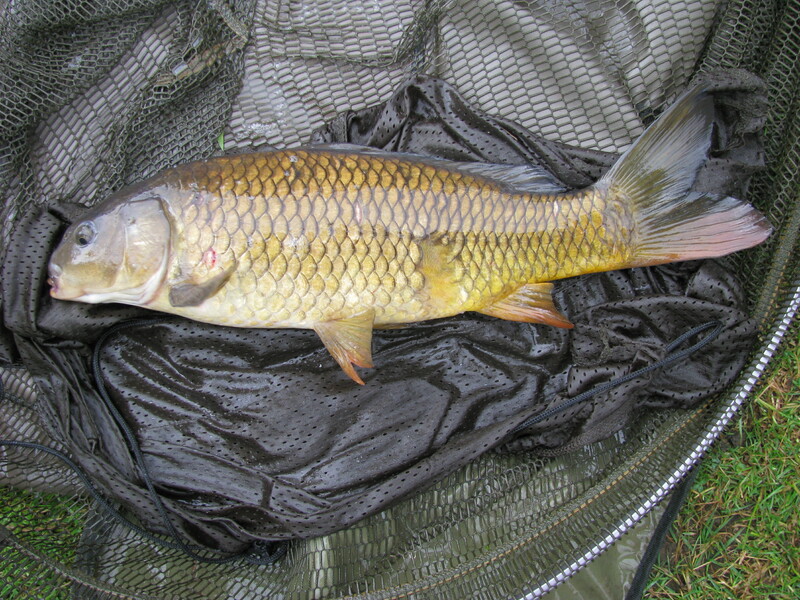 but 5-10 minutes later it came to the net… a nice 12lb 11oz Common Carp. Then another – but unfortunately I didn’t get to land it as the line snapped just above the hook – presumably from wear/rubbing whilst playing the previous fish through the bushes, etc as I felt the fish but the line parted on the strike – although I do check and test the end tackle after each fish or recovery from snagging. 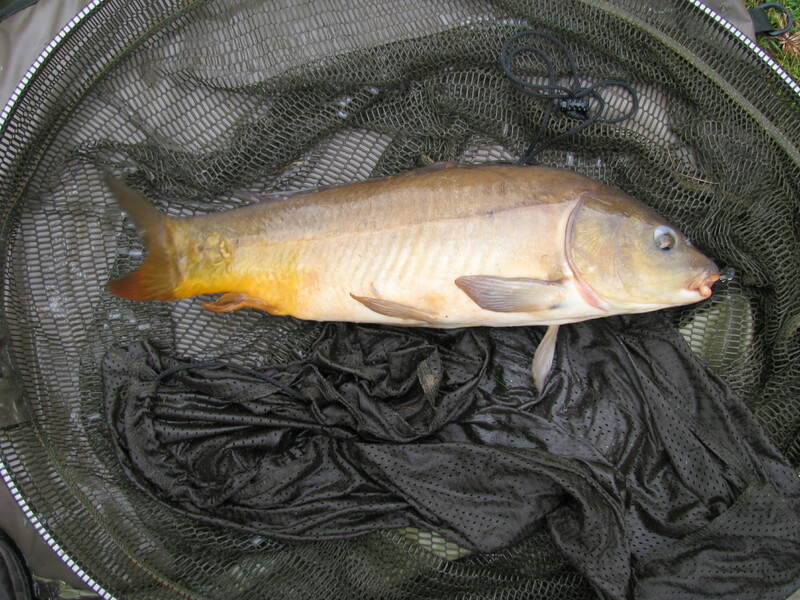 But just before I packed in at 1645 another nice fully scaled mirror carp of 10lb 4oz was landed…. 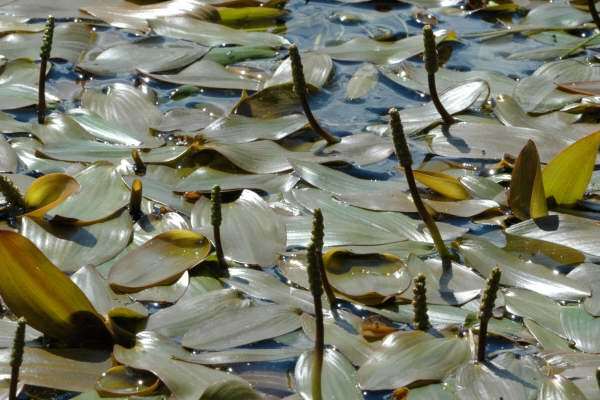 Very important when fishing floating baits! 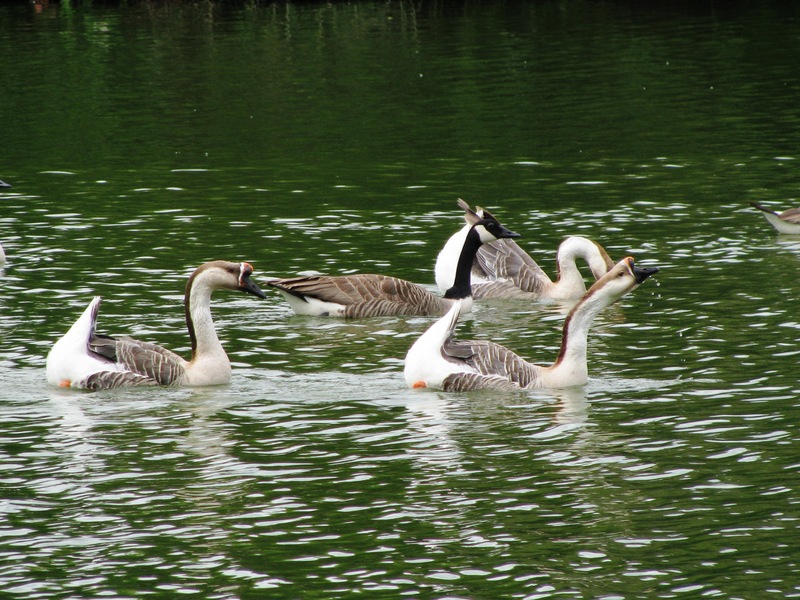 Do NOT attempt to strike into a fish when fishing floating baits UNLESS line is actually being taken! 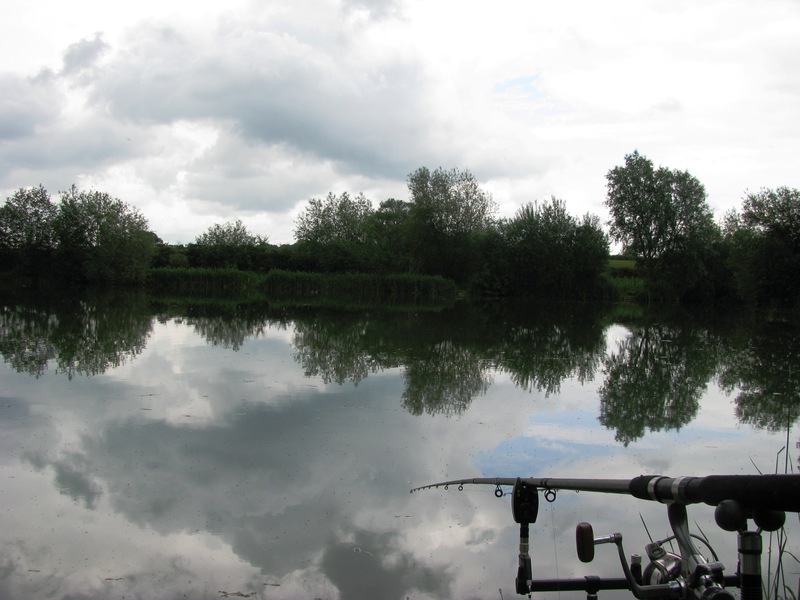 Striking at the wrong time CAN and ALMOST CERTAINLY WILL damage fish which leads to club rules disallowing floating baits, etc and rules are what no-one wants or needs – learn to do things correctly and there’s no problem and no damaged fish. Striking at the wrong time can cause poor hook holds and bad hooking due to usually striking when the fish has not properly taken the bait or had taken and then quickly rejected it resulting in just catching the barest of skin leading to ‘lip rips’ or being hooked outside of the lips. The ONLY way to be sure that the bait is in the fishes mouth when you strike is to watch for line being taken steadily and then striking, or rather,‘pulling’ into the fish rather than the ‘snatching’ which ‘striking’ as a term suggests. 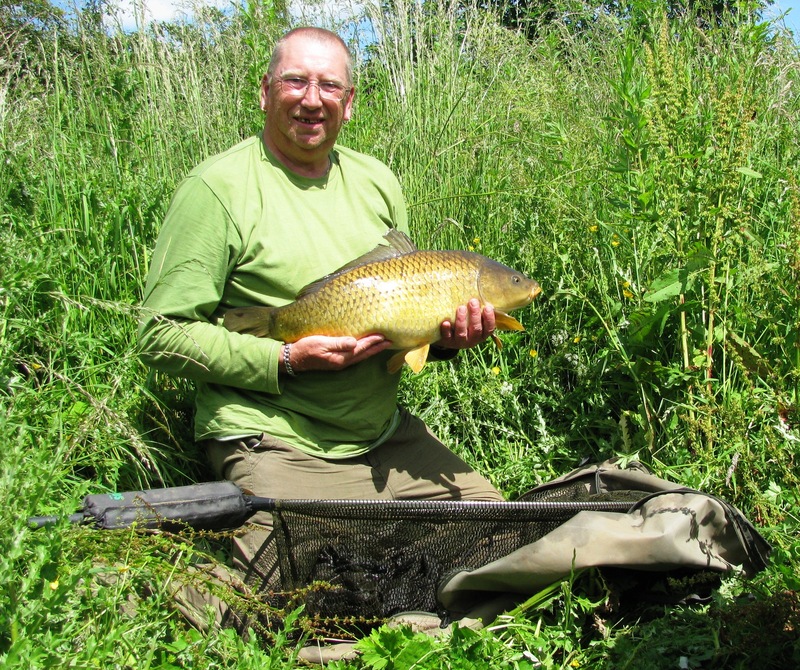 The final three fish (inc the ‘lost’ one) were all taken on what would generally be regarded as large baits – in these cases, each bait was half a slice of bread but often I use a full slice… a thing I picked up from a Matt Hayes television programme. Take a slice from a sliced loaf, push the hook through the back of the slice in the centre near top crust and pull completely through the front, lay the hooklength down the slice and push the hook back completely through from front to back at the centre near the bottom crust and then rotate the hook and push into that crust. Now roll the slice around the hooklength so that it lies in the middle of the resultant roll and squeeze (crimp) towards the top and bottom of the roll so it looks a bit like a christmas cracker. The result being a large bait that will stand a good heave out and travel a good distance. I prefer this to a smaller bait and having to resort to a controller float or other attachment to add weight for longer casts. And hads other advantages as mentioned below too. OK… all that is necessary now is to cast out your bait to your required area.. and wait. What are we waiting for?? YES, FOR THE LINE TO START BEING TAKEN!. And, if ever that was an important thing to do, then this is that time as with such a large bait it is unlikely that it will be taken in one go… and it really should not be expected for it to be so. A large bait like this allows for (a) small fish to peck at and release small pieces to drift or sink as an attractor and (b) for a wary fish to batter and create smaller pieces and to ‘test’ it. 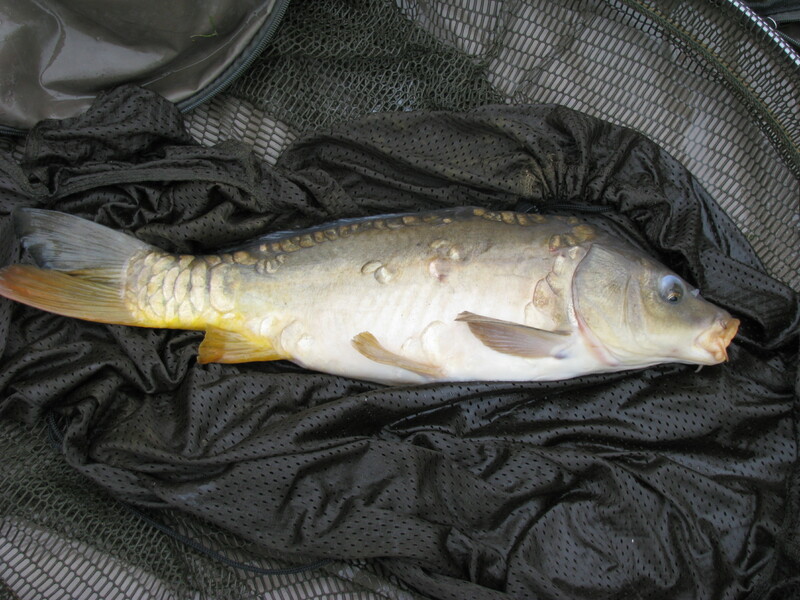 So you should quite a bit of ‘action’ at and around the bait before it gets taken properly – and striking at this pre-taking period will result in (a) complete misses which can unnerve the fish, (b) loss of the bait which may drift out of your swim taking the fish along with it or (c) pricked and scared and possibly damaged fish – and none of those is at all desireable. And so, I empthasise again and make no apology whatsoever for that – DO NOT STRIKE UNTIL LINE IS GOING OUT WITH FLOATING BAITS – SMALL or LARGE!! 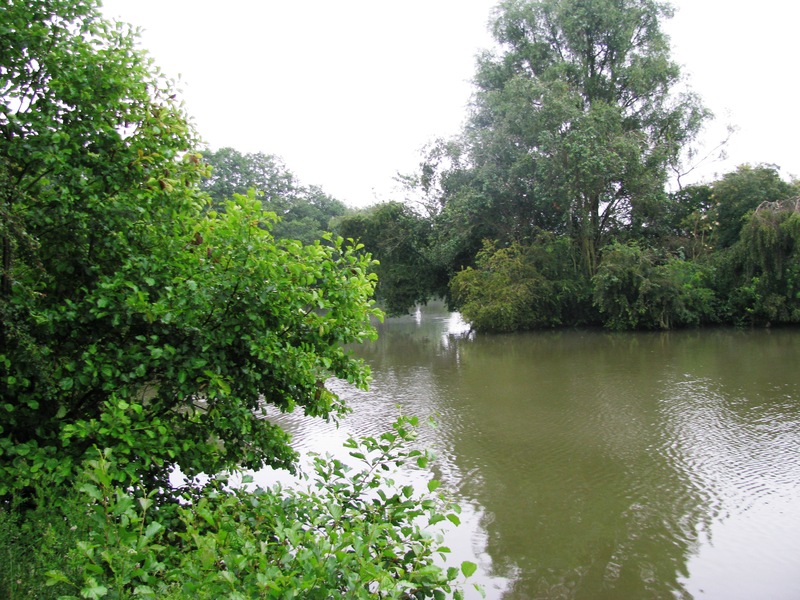 Not sure of future plans other than Liz and I will be fishing on Saturday 21/06 at a local Hall’s pool which is only fished for five weekends a year – and that by invitation to our club as part of the Hall’s fund raising activities which terminates with its Open Day. We’re allowed 6 anglers per day on each Saturday and Sunday of the period, each ‘donating’ £10 to the local church’s funds. A great pool and it’s usually a great day there. But I may, in the week, sneak a short, 0400 start, session in at the local canal. So, OK – that’s it for this posting…. 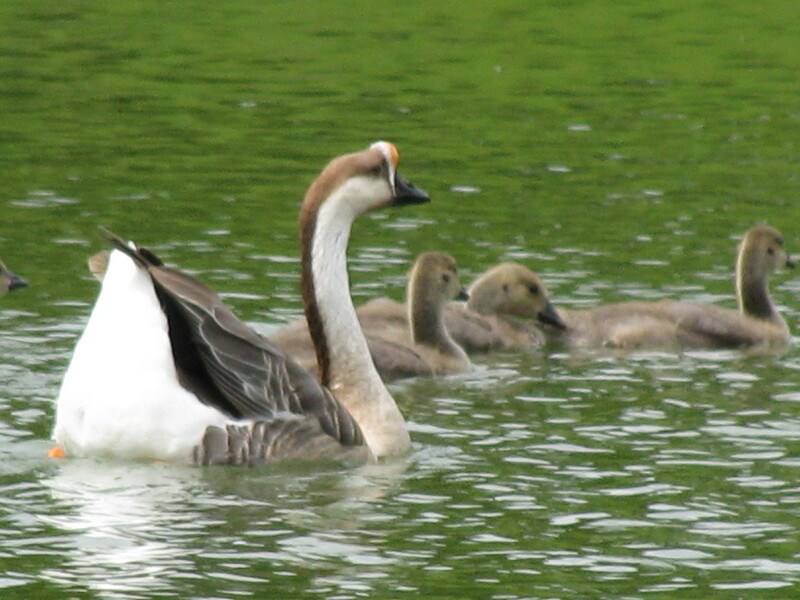 I set off for the tench pool at 0600 arriving there at around 0700. 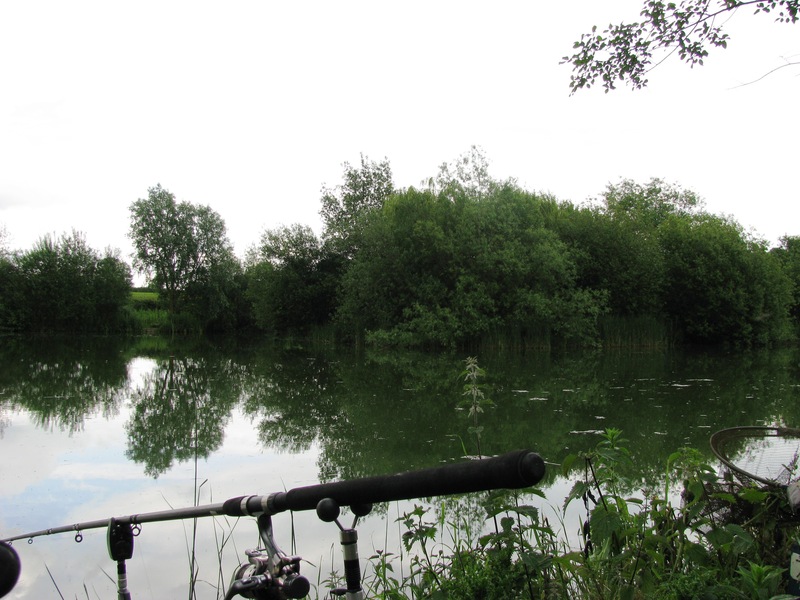 I unloaded the car and took my gear to my chosen peg for the day – Peg 24. 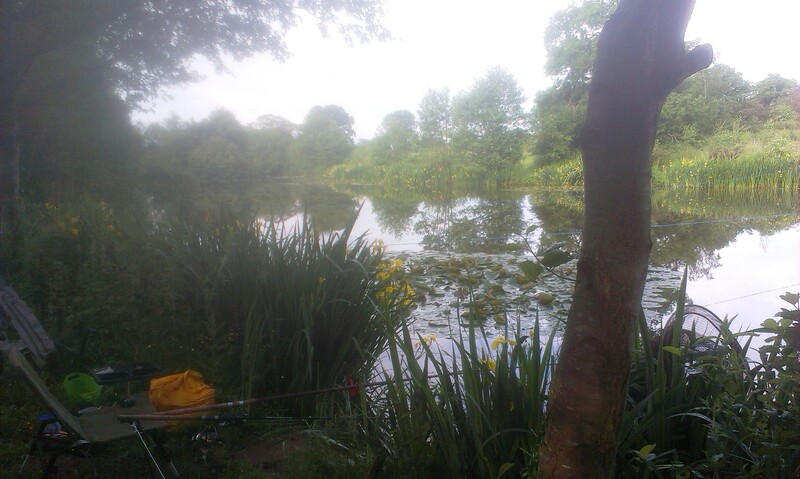 On arrival there I baited up, just off the lily pads to the left, with 0.5Kg of breadcrumb laced with dead maggot, gravy granules, bloodworm and halibut pellet and also baited and area to the right with mussel and prawn. And then set up my ‘station’ and rods ready to begin. At this point it was glorious morning with the blue skies and sunshine in abundance. 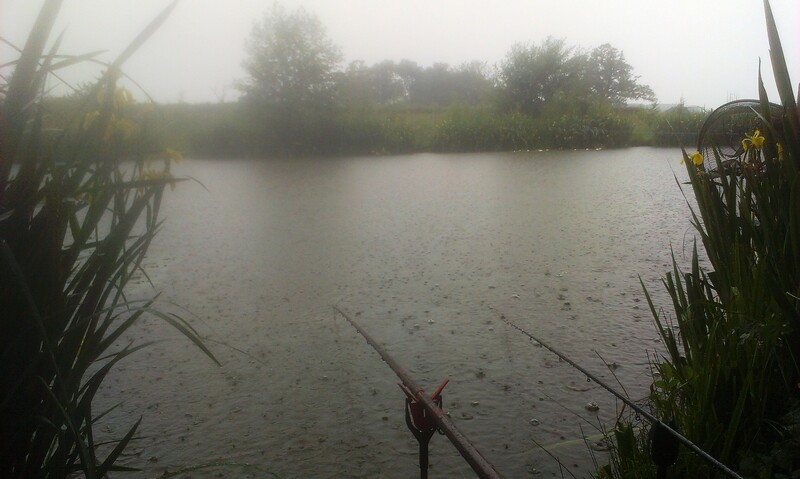 First casts were made at around 0845, floatfishing worm and maggot by the lily pads and legering mussel out to the right. For the first hour all was well, despite the lack of bites on either rod, but then the skies darkened and light rain started to fall necessitating the erection of the brolly – and it was good to have that warning as the skies darkened and rain fell heavily and increasingly accompanied by thunder and lightening… however, that cleared after a while and a glimpse of blue skies appeared once more… but not for long as the darkness descended once again and the rain lashed heavier than ever with the thunder getting closer…..
And, obviously, as I travelled home the skies turned blue, the sun blazed … and has done so ever since! Tonight there is planned a grass cutting session at the pool and I’d loaded my strimmer to take part in that but I’m not going to make it back. Just finished drying my gear and putting baits away, etc. But I’ve also repacked my gear as to be ready for a trip out on Friday… probably to a pool in Newport – although unlikely to be the pool I visited last week – or I may visit a section of canal that is no longer open to boats that is also available on that club’s card…. AND NOW… a soak in the bath with a mug of hot chocolate! Session 23 – Some Days You Really Shouldn’t Even Think Of Getting Out Of Bed. Started at bedtime on the night previous when my usual aching hip and knee were worse that usual and consequently I was awake until 0400 and when I did eventually succumb to tiredness I had a nightmare’ish dream until the alarm went off at 0500 ready for me to rise to get ready to venture out at 0600. As I’ve said previously, the destination of the day was to be a pool I’d not visited before near Newport, Shropshire – and surprisingly getting to the pool was without most of the usual ‘getting lost’ bits that are part of going to new places although I did have to do one turn around in Newport village itself. So, I arrived at the pool – and the start of the major problems of the day which ensured that having arrived at the pool at 0700, I left again at 0900 – without even unpacking one item of tackle! Instructions for parking on the club’s card said to ensure that the farm track down which you travelled was clear when parking your vehicle – looked to be no problem as there was a grass patch off the track on the edge of the pool. However, there was a slope down to the pool at the edge of it and attempting to reverse the car so that I could easily drive back out the rear wheels just went over – and with the damp conditions the front wheels lost enough grip to be unable to pull the back end back up – and with each attempt the back slid round and further down the slope despite trying to fit twigs, bits of branches, a blanket, etc under the front to try to gain the necessary traction. And in the end the ONLY thing preventing the car going into the pool was a tree which the back end of the motor eventually came to rest on – but at least did so gently so no damage or scratches. Anyway, there I was 30 miles from home, in the middle of nowhere virtually, with no-one to call who would know how to get to me and completely stuck. So, I did the only thing that I could do, walked back up to the road and scanned around and spotted some barns across the fields and so headed over there to see if I could get a farmer with a tractor to come give me a pull out. Anyway, after a good half mile of walking I reached a farmhouse, but it was not a working farm. However, I was pointed to another place another quarter of a mile away… and headed off up there. And to my great joy the people were all to happy to assist me in my plight and shortly I was sat in a tractor heading back to the car… which the guy quickly hooked up to and towed out back on the path… Which would have been OK even at that point … BUT looking a little way down the track there appeared to be another cut patch of grass for car parking and it looked level .. and in ways ideal. But looks can deceive (plus the fact that even 40+ years after passing my test I stall cannot reverse, even up my home driveway which generally takes 4-5 attempts to get close to right and then I give up) and just off the edge of this level patch was a slope that was hidden under a patch of tall weeds… and, yes, I ventured 6” off the flat patch onto the slope, and then couldn’t get the back end up again. ANOTHER walk to the farm to ask the guy if he could rescue me again which thankfully he did. But at this point in time I’d had enough and followed the tractor back up the track with the intention of heading back home. So two hours I’d been there, and all of it virtually spent dealing with the car. 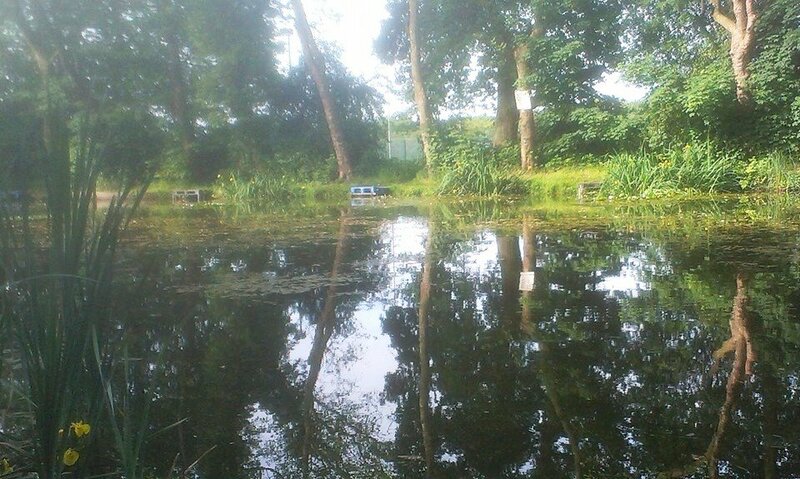 So arrived at the pool at 1000 and set up in a nice looking swim right next to where the car was parked (peg 4)… with an island opposite with an overhanging bush and reeds lining it’s bank. Typically perchy/tenchy feel… So baited up with a few spombs of particle baits with maggots and small pellets just off the overhanging bush and over the session also catapulted a small but regular supply of maggots and pellets. Also a few mussels and prawns were fed just off the edge of the main baited area. Tackle was 2 11’ 1.75lb TC Avon type rods both with 8lb line… one was baited with maggot and/or worm on a size 12 hook, the other with mussel on a size 6. Both legered. Two hours later and not a touch! At this point I was considering packing and heading home as tiredness from the sleepless night started to catch up but I first thought to have a little wander along the banks… and on reaching peg 7, the open water just off the end of the island, there seemed to be a large amount of ‘bubbling’ activity taking place and so I nipped back and moved my tackle, etc up to that peg, catapulted out some feed and cast out the rods… which seemed to kill all sort of activity DEAD! Bubbling stopped, even the fry dappling the surface seemed to disappear… and another two hours later I had still not had one touch. At this point I decided to call it a day, packed up and headed home….. But may that be a VERY long way away! !